Inspired by the swinging, hedonistic atmosphere of the one American city that overcame the Great Depression, the Kansas Smitty’s House Band stands apart from all other groups currently populating London’s booming 1930s music scene, achieving an authenticity of style and virtuosity without rival. 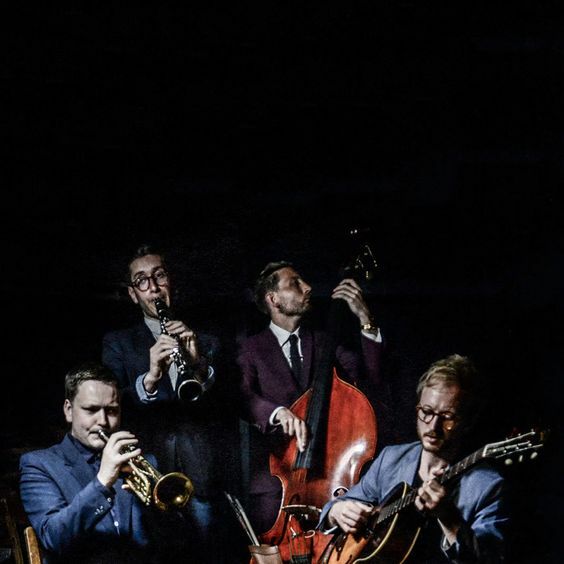 Perhaps the only London jazz band to own their own bar – a beautiful 2-storey cocktail & jazz club on Broadway Market – the Smittys are fast becoming the UK band best known for recreating the true atmosphere of the USA prohibition era. If you would like to provide your guests at your corporate events, parties, balls or weddings with great musical entertainment The Kansas Smitty’s are available for hire through Contraband. The Kansas Smitty’s primary style is instrumental swing, incorporating the sounds of New Orleans Dixieland, classic big band swing and straight-ahead 1950s bebop. Their enormous repertoire also encompasses Parisian gypsy swing masters such as Django Reinhardt, the Latin and Cuban street sounds of New Orleans Mardi Gras, and an array of influences from blues to bossa nova. The band features anything from four to eight players, covering repertoire from giants of the genre including Count Basie, Fats Waller, Ella Fitzgerald, Louis Armstong and Sidney Bechet. 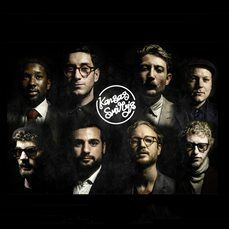 The Kansas Smittys have quickly established themselves as the most exciting young jazz band in London, enjoying residencies at venues including Ronnie Scotts, the 606 Club, the Vortex Jazz Club, Mayfair Arts Club, Shoreditch House, Servants Jazz Quarters, Vault Festival and many more. 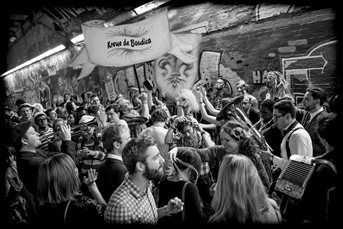 They have delighted audiences at festivals including Secret Garden Party and Camp Bestival and performed beautiful private events across the UK and Europe. The band features some of the brightest talents on London’s live music circuit. Giacomo Smith, a Ronnie Scott’s regular and “a welcome addition to the London scene” (London Jazz News), leads on alto sax and clarinet. 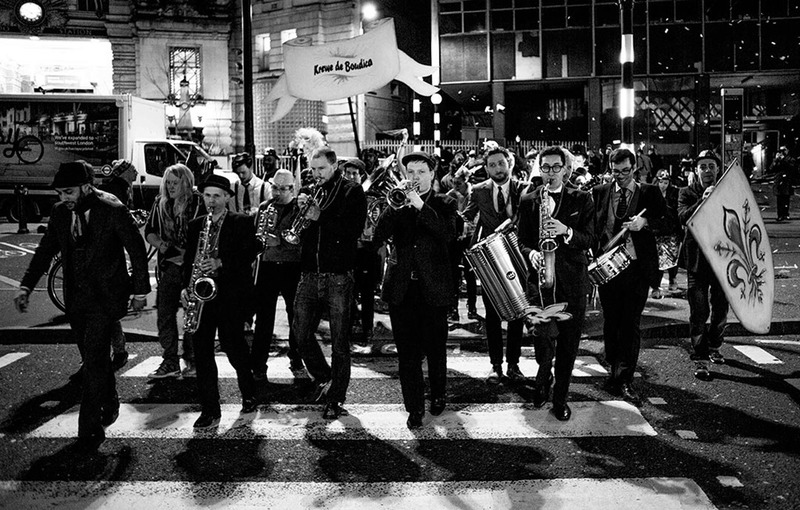 Reuben Fox (tenor sax), Pete Horsfall (trumpet) and Theon Cross (tuba) complete the front line. The band’s rhythmic identity pivots on the Freddie-Green-like playing of David Archer on guitar and the double bass of Fergus Ireland. The phenomenal Reuben James, “an exceptional pianist” (Cheltenham Jazz Fest), and Ronnie Scotts’ house drummer Pedro Segundo, whose “musical ability combines a blend of styles creating a unique sound on the drum set” (Ronnie Scotts), add layers of rhythmic spontaneity that complete the back line.